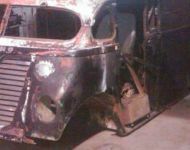 The International Harvester Metro Van that’s been a back burner project for some time is finally coming together. Check out this photo gallery for the latest pictures of the build. Be sure to leave your thoughts and comments below!